Left atrial thrombi are the most frequent masses found in patients with atrial fibrillation, but other primary or metastatic tumors of the heart must be overruled when a pedunculated mass is present. Atrial myxoma accounts for up to half the cases of all atrial tumors. Although the atrial myxoma is considered to be unusual in older people, with the advent of newer imaging techniques and longer life expectancy, the incidence of myxoma in older people has increased1. We present a case of a 82 year old male patient, with non-valvular atrial fi brillation and concomitant diagnosis of both left atrial myxoma and left atrial appendage thrombus. The patient was admitted for moderate exertional dyspnea exacerbated during an upper respiratory tract infection. He was on treatment with oral anticoagulants, beta-blockers, digoxin, statins and ACE inhibitors. The transthoracic echocardiography revealed a 4.5/3 cm left atrial mass attached via a small stalk to the inter-atrial septum (Figure 1). We mention that a previous transthoracic echocardiography performed two years before this admission showed no intracardiac mass. 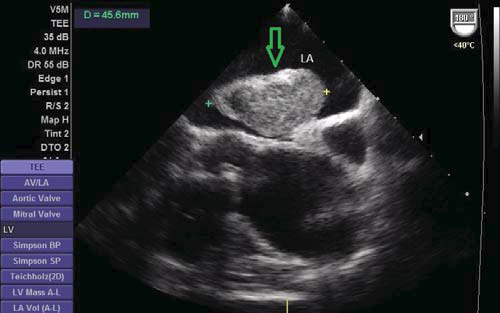 The transesophageal echocardiography confirmed the presence of a pedunculated, hypermobile, unomogenous echogenic mass attached to the interatrial septum (Figure 2). We could also note spontaneous left atrial contrast echoes (Figure 3) and the presence of another floating mass into the left atrial appendage (Figure 3 and 4). Based on the clinical data, vegetation, a thrombus originating from the left atrial septal pouch and a coincidental primary cardiac tumor were considered as possible differential diagnosis for the pedunculated mass. Figure 1. 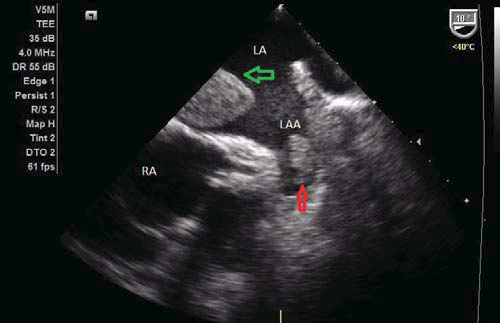 Transthoracic echocardiography (parasternal modifi ed short axis view) showing a left atrial mass (green arrow). Figure 2. 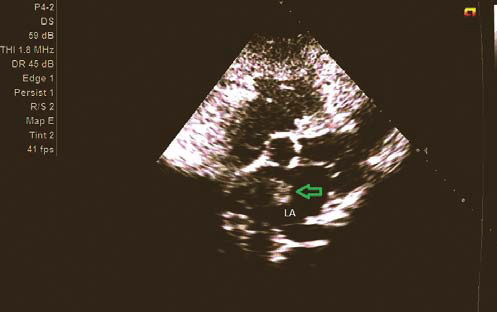 Transesophageal echocardiography showing an unomogenous echogenic mass attached to the interatrial septum (green arrow). Figure 3. Transesophageal echocardiography showing spontaneous left atrial contrast (white arrow) and a thrombus in the left appendage (red arrow). Figure 4. 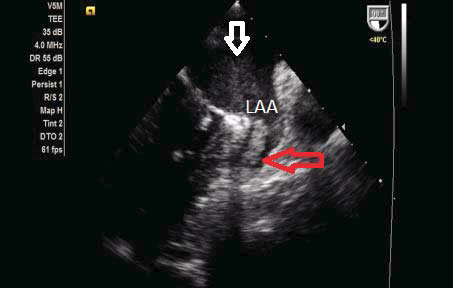 Transesophageal echocardiography showing two masses in the left atrium. Figure 5. 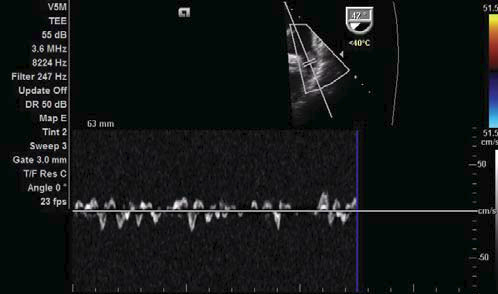 Transesophageal echocardiography: Decreased left atrial appendage velocities. Figure 6. 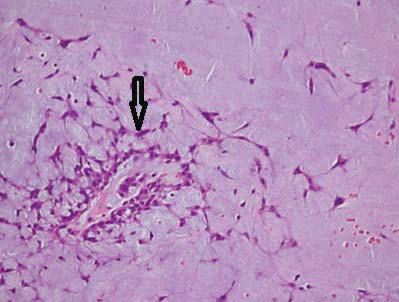 Hematoxylin- Eosin staining on histological examination showing polygonal cells (arrow) into a myxoid stroma. The lack of fever, inflammation and the negative blood cultures (collected 12 hours apart) excluded an infectious endocarditis as a possible diagnosis. In view of the abovementioned observations, we ceased the therapy with oral anticoagulants and a therapy with unfractionated heparin was initiated. Taking into account the embolic risk and the impossibility to make de differential diagnosis between a very fast growing atrial tumor and an attached, organized thrombus, the urgent cardiac surgery was recommended. A coronary angiography performed before intervention showed no signifi cant CAD. Shortly after angiography, the patient presented an embolic stroke. One month after the stroke, the intra-atrial mass was surgically removed. Macroscopic pathological examination showed multiple pieces of hemorrhagic gelatinous fronded material and the histologic examination confirmed the diagnosis of myxoma (Figures 6 – Heamotoxyline – Eosine, x100). In conclusion, even if a left atrial mass is more likely to be a thrombus in the presence of atrial fibrillation, enlarged atrial chamber and spontaneous atrial contrast echoes, a more aggressive diagnostic approach is necessary to rule out the presence of a primary or secondary tumor of the heart. Sometimes, an atrial myxoma could coexist with thrombi, making more difficult the right diagnosis. 1. Burke A et: al. Cardiac tumors. Heart. 2008; 94:117-123.